Scroll down to see my post tour thoughts and video! Yes Msr have finally seen the light, its no longer yellow!! 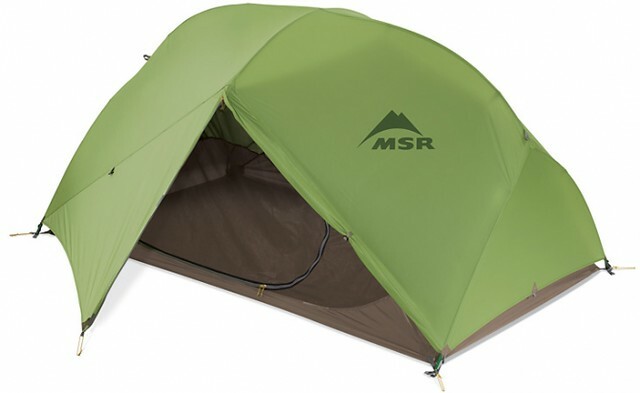 Summer 2011: Msr have seen the light and changed the colour of their tents. The recession is still in full swing here so there’s almost a tent price war going on between various outdoor internet shops. So when I saw the new MSR Hubba Hubba Tent V6 in green for only €270 and knowing I’ll be spending most of the next 2 years wild camping in Africa I just couldn’t resist buying the 2011 model. 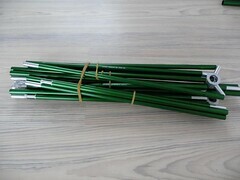 The green colour is lighter than I thought but its actually the ideal colour for camping between bushes and other low greenery. The crappy tent pegs are history and MSR have finally seen the light and changed to my favourite stakes (V-pegs from DAC) these are the same stakes used by Hilleberg. They’ve also strenghend the lower guyline attachment point. 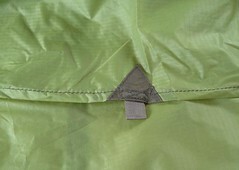 Just like the previous version the bottom of the outer tent is quite high from the ground to allow better ventilation. This is nice unless its raining really hard, then the rain splashes up and under the outer tent…..can’ t have everthing I guess. 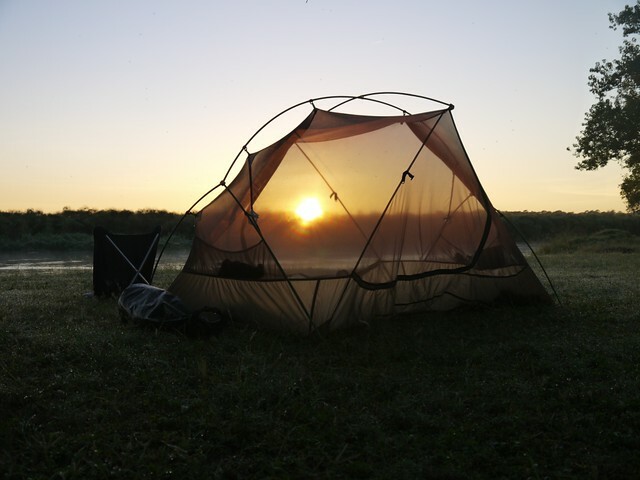 In summer 2011 I tested the tent in a nasty summer storm without problems. 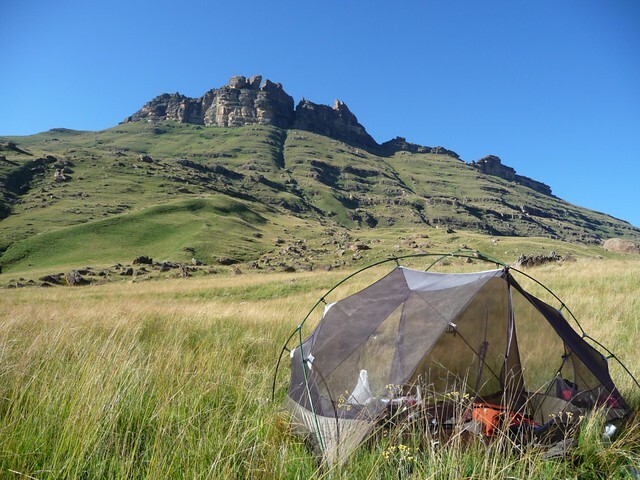 I have no doubt this is the ideal tent for Africa, and is probibly one of the best 3 season tents on the market. With a good sleepingbag I’ve slept to just above freezing point. In warmer dryer weather I just use the inner tent for maximum ventilation. Room for improvement? : Maybe MSR shouldn’t be so cheap (or shouldn’t cheat in the published weight) by including guylines and a couple more pegs with the 2011 model. Yup the tent came without guylines and only has 6 pegs. The only other improvement I can think of is changing the colour of the ceiling panel in the inner tent, its still white which reflects the moon very nicely when using only the inner tent. This makes it almost glow in the dark, goodbye stealth. 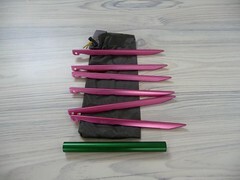 Pink pegs? whats that all about, maybe I won’ t loose these ones in the grass I guess…..
Now after 180 nights of use in Africa I’m still of the opinion that this is the ideal tent for Africa. 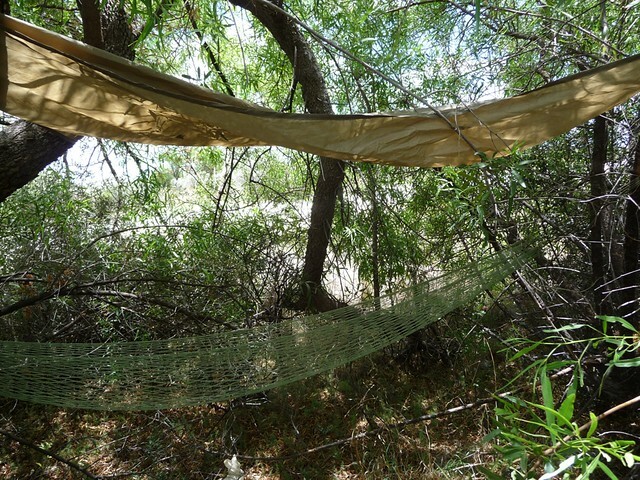 The mesh has a few holes probably thanks to thorns and bushes during wild camping. 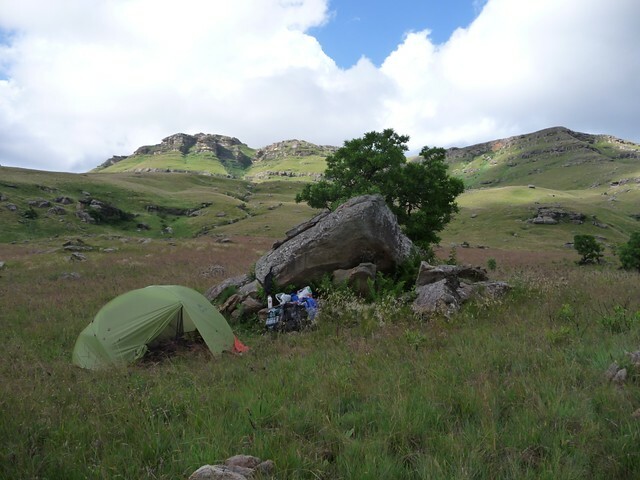 The tent is spacious, easy to set up, light and surprisingly durable. The foot print is essential to protect the bottom of the main tent, it also doubles as a tarp for shade on those warmer days. I am under no illusions about the tent floor being waterproof after so much wild camping in the desert, but thanks to the foot print its not as bad as it could be (the footprint is now almost as much duct tape as other material). Thanks for the update on the MSR Hubba Hubba. It is good to have reviews on gear used cycle touring as we tend to use it for much longer periods than the hiking crowd and so get a better idea of durability. The MSR Hubba Hubba is too big for my use but still good to know about their Hubba durability. Liked the comment on the footprint too. I take it is not made of Tyvek?